Add about 30 drops of yellow food coloring to one of the cups of water. Then repeat with the blue in the second cup and the red in the third cup. Fold three paper towels in half vertically. Place the first end of one paper towel in the blue cup and the second end in the yellow cup. Place the first end of the next paper towel in the yellow cup and the second end in the red cup. Finally, place the first end of the last paper towel in the red cup and the second end in the blue cup. You’ll immediately be able to see the colors travel up the paper towel strips. Explain to the kids that this is due to the water being absorbed by the paper towel. Then wait a few hours as the colors travel farther up the towel. Eventually the primary colors will mix to create the secondary colors: green, purple and orange. Instead of arranging the cups in a circle, you can also line them up with an empty cup in between two cups of colored water. 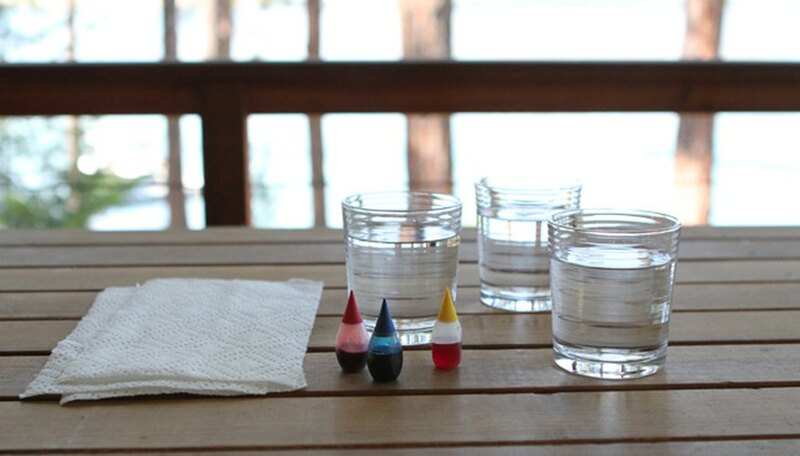 Leave one end of a paper towel in the colored water and the other end in the empty cup. 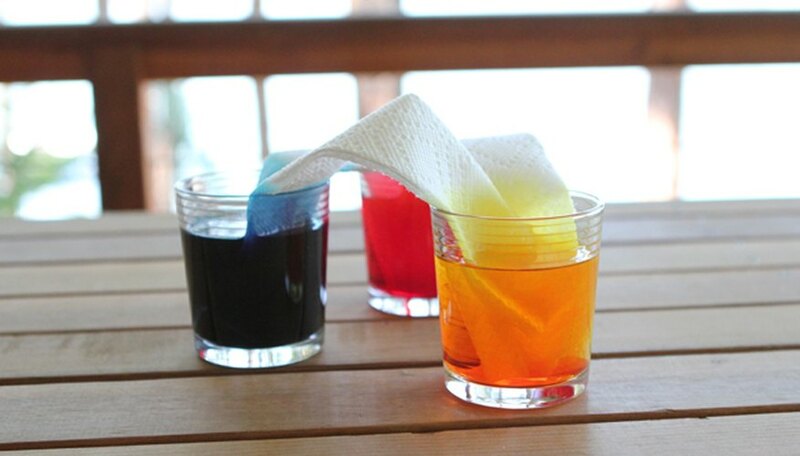 Do the same with another color of water and watch as the towel drippings mix in the empty cup to create a third color. 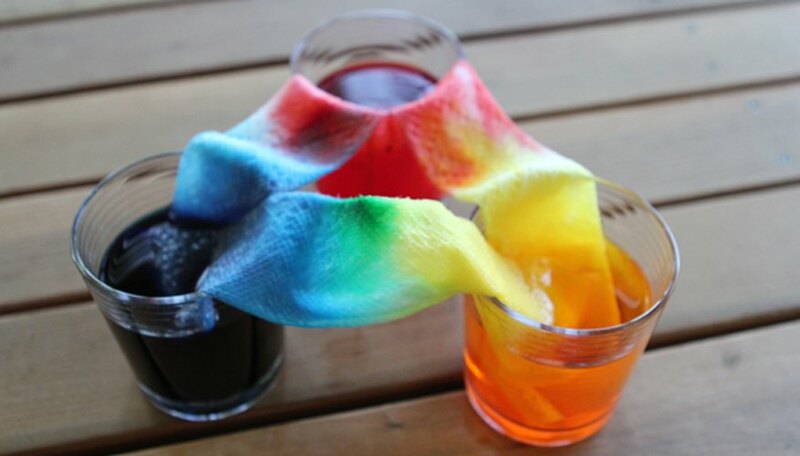 Another variation of this experiment is to place drops of food coloring halfway up paper towel strips and then place the ends in plain water. As the towels absorb the water, the colored spots will grow upwards, perfect for slow color races. Stephanie Morgan is a style and parenting blogger, and the founder of Modern Parents Messy Kids (MPMK for short). MPMK, voted Best Craft Blog in "Parents" magazine, provides daily inspiration to thousands of parents on how to engage with their kids, simplify life and create a stylish home. Morgan, Stephanie. 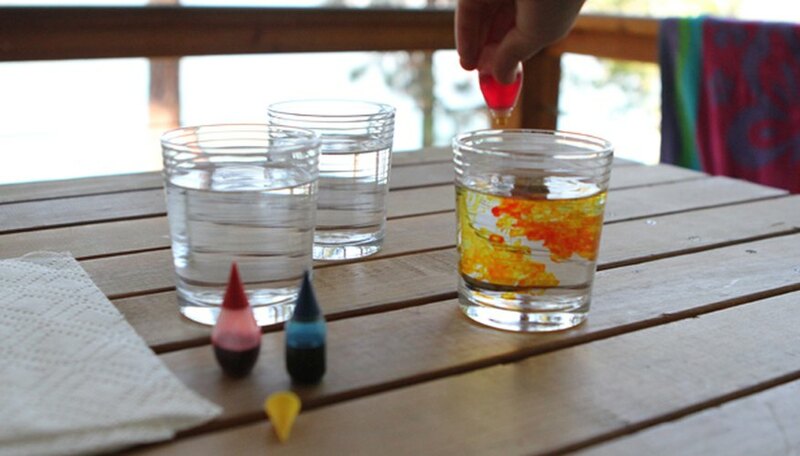 "At-Home Science: Color Mixing Experiment." 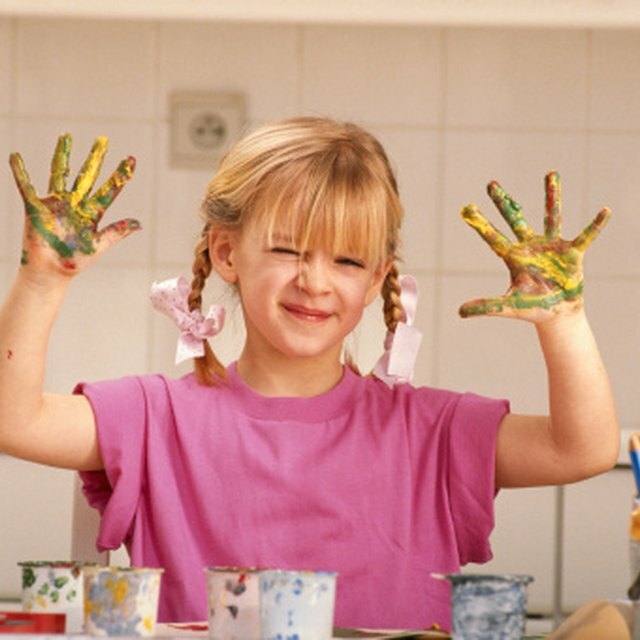 Sciencing, https://sciencing.com/at-home-science-color-mixing-experiment-13557780.html. 17 October 2017.